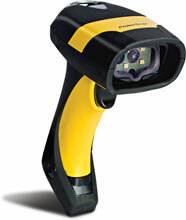 Datalogic Scanning's PowerScan readers are the top rated industrial handheld data collection products on the market. Long known for outstanding durability and performance, the PowerScan brand of products continues to offer the ultimate solution for demanding industrial applications. The PowerScan 8500 reader offers the richest feature set of Datalogic Scanning's industrial handheld products for the omnidirectional reading of one-dimensional (1D) and reading of two-dimensional (2D) codes as well as the capability of multiple code reading in a single read. PD8530	 PowerScan D8500 Standard Range, Scanner Only - Cables and accessories must be purchased separately. These include USB (Part# CAB-441), PS/2 (Part# CAB-442), or RS-232 Serial cables (Part# CAB-433) and a Power supply (Part# 90ACC1920). CAB-441	 Datalogic USB cable (Type A), 8 ft. coiled, REQUIRES External Power supply (Part# 90ACC1920). The Datalogic PD8530 is also known as Data Logic	DTL-PD8530	.